So it is in the world of UX design, where methodology matters most, especially in the pursuit of clients and career opportunities. One of the best ways for UX designers to demonstrate methodology and show problem-solving proficiency is through a well-designed portfolio website. Likewise, designers should tailor portfolios to a specific audience—a.k.a. the people they want to work with and the industries they want to work in. Why? UX design is a wide-ranging field with diverse titles like interaction designer, UX researcher, information architect, and experience strategist. These roles exist to improve the user experience, but they aren’t the same. Each makes its own unique contribution to the product design process. A great way to find portfolio inspiration is by taking cues from UX design agencies. This example from Momentum Design Lab shows how to summarize a complex design process with simple graphics and clear language. 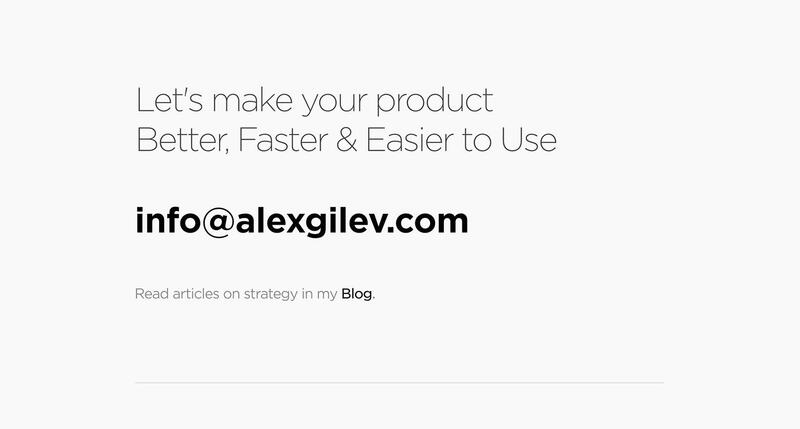 Providing compelling examples of UX portfolios. When it comes to UX portfolios, designers can’t afford to be ambiguous about the skills they possess, the process they use, or the kinds of projects they specialize in, but they should also be wary of presenting too much information. Likewise, UX portfolios should not be a repository for ALL past work. Pick projects that are specific, recent, and outstanding, and present them as a process with all the UX design steps it took to arrive at the best solution. Striking a balance between clear and concise requires planning. Before a single UX portfolio page is outlined, there are crucial questions that need to be addressed. Don’t skip these. 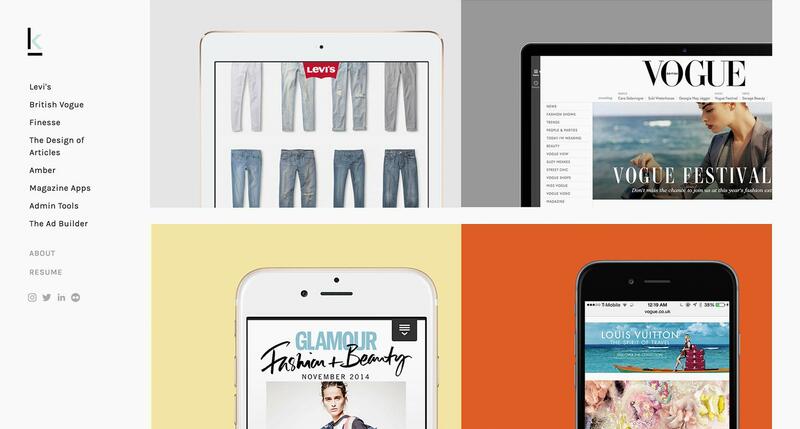 The answers unlock must-have portfolio content and serve as a site’s organizational framework. What Type of UX Designer Am I? Don’t confine future career opportunities to past job titles. Take time to evaluate what you actually do and how you do it. You might be surprised to find that you’ve been mislabeled throughout your career. The goal of this question is to get to the center of your UX design process—to uncover the problem-solving patterns you rely on again and again. Is there a common thread that runs through the types of UX design problems I typically solve? What are the recurring steps of my UX design process? What methods do I use to conduct research, and what do I do with my findings? Are there problem-solving approaches that I value above others? How did I arrive at this point in my UX design career and what kind of relevant experience do I really have? *Pro tip: Once you’ve addressed these questions, summarize all of your answers in a single, easy-to-read sentence, and display it prominently on your portfolio’s “Home” or “About” page. 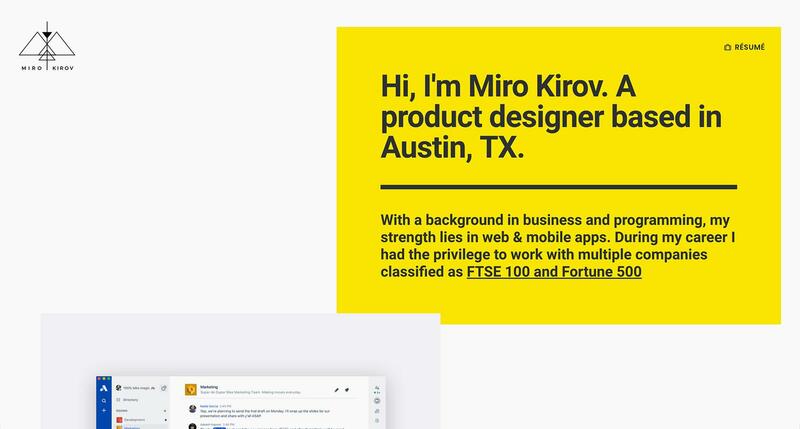 Product designer Miro Kirov welcomes visitors to his portfolio website with a clear description of his professional background, strengths, and credentials. In doing so, he also hints at the type of clients he’s seeking to partner with. What Do I Do in the Field of UX Design? Once the inner workings of your problem-solving process are understood, it’s time to get more specific about what it is you actually do as a UX designer. Again, it would be unwise to let past job titles inform your answers. Am I a UX researcher or designer? Am I a UX generalist? Can I move effortlessly between UX research and design? Am I a specialist? Is there a specific UX research or design task that I excel at and want to do above all else? Do my skills reach into UI design and visual design? Do I have the ability, experience, and desire to manage a team of UX professionals? Your answers are important because they reveal what projects should be included in your portfolio and how to frame your involvement. UX/UI designer Kat Windley uses portfolio cover images to showcase her experience working with heavy-hitters from the fashion industry. For instance, if you really want to work as an interaction designer, it would be unwise to build your portfolio around projects and written descriptions that emphasize past experience in a niche area of ethnographic research. What Are My Relevant UX-related Skills? Here’s a hard pill to swallow: A long list of “relevant skills” on your portfolio site doesn’t add value for your visitors. Long lists of design skills and accomplishments are hard to read and easy to gloss over. There’s a better way to promote your UX design abilities—through the lens of your projects. This means weaving the design programs and methods that you use into the presentation of your project visuals and descriptions. What did I contribute to this project at each phase in the UX design process? What tools and techniques did I use to make these contributions? Did I create or help implement a strategy that had a major impact on the end product? Was I involved in early client talks or crafting the project proposal? Were there any major obstacles that required me to perform tasks outside of my normal area of expertise? *Pro tip: Some UX designers include a “Skills Used” summary for each project in their portfolio. 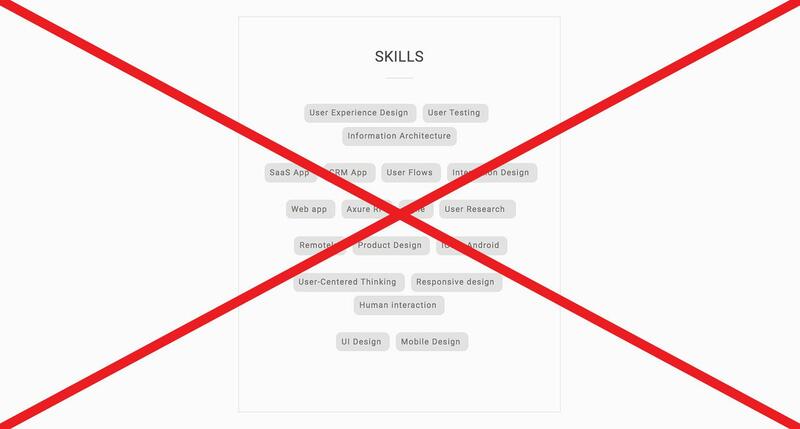 This can be effective, but it can also backfire if you list too many skills or highlight ones that don’t fit within the overall framework of your UX design process. How and for Whom Do I Want to Use My UX Design Skills? It can be difficult for young or inexperienced UX designers to know the kind of job they want to take, but with a few years of seasoning and a handful of successful projects, it becomes easier to envision a desirable career path. This is an important aspect of UX portfolios. The kind of people you work with, projects you work on, and industry you work in need to be made clear in the examples and written descriptions of your portfolio. For example, if you have the very specific ambition to be a user researcher for digital products that impact the world of collegiate sports, your portfolio should make it clear. What are the top two industries I’d like to work in? Do I have projects or past experience that will help me land a job in my preferred industry? What kind of working pace do I enjoy? Am I ok with long hours? Do I want to freelance? Work with startups? Land a corporate career? Is there an organization or cause that I want my work to impact? How much do I want to be paid? Where do I want to live? Do I want to work remotely? This isn’t an exhaustive list, but it’s a good place to start. If you’re a skilled UX problem solver, you’ll be in high demand, but this also means that people will be willing to hire you even if the fit is wrong. Ultimately, you have to be your own advocate and plan a UX career that aligns with your ambitions. Bottom line: Treat portfolios like professional projects, and incorporate these practical design tips for a site that really shines. Present the artifacts of your UX design process in a clean, uniform, and sequential manner. 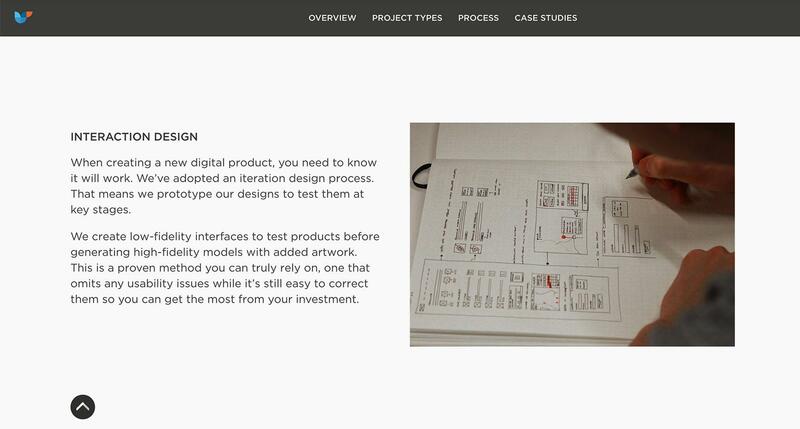 This includes sketches, wireframes, user journey maps, prototypes, and more. Including features like complicated animations or unconventional page layouts can distract visitors from the real reason they came to your site—to see your work. It’s ok to show glamour shots of a final product, but this is only a small part of the story. Hiring managers and potential clients want to quickly see and understand your process, and a glossy interface doesn’t get to the heart of your problem-solving contributions. 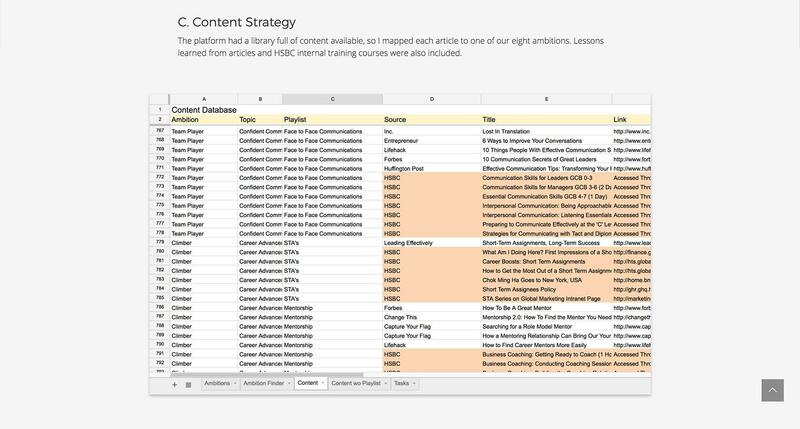 Seasoned UX designers like Jeffrey Davis know the value of showing the unglamorous artifacts of their design process (like this content strategy spreadsheet). Even UX design agencies like Cyber Duck share concept sketches and low-fidelity interfaces as a way of demonstrating their problem solving process. Provide a high-level summary of each project in your portfolio. Succinctly define the problem, and show how various solutions were explored. Project summaries aren’t about listing what you did; they’re a chance to show how you delivered beneficial results. Bill Tribble’s project summary succinctly defines a UX design problem and introduces his role in the solution. No one comes to your UX portfolio site to be impressed by your extensive knowledge of technical jargon. Use a voice that is both approachable and professional, and avoid excessive self-promotion and insider humor. Aim for “evergreen” language that will stay fresh as technology changes. Simplicity shows understanding, so write in plain language that can be easily grasped by non-experts. After all, the person in charge of hiring you may not be familiar with sophisticated UX terminology. 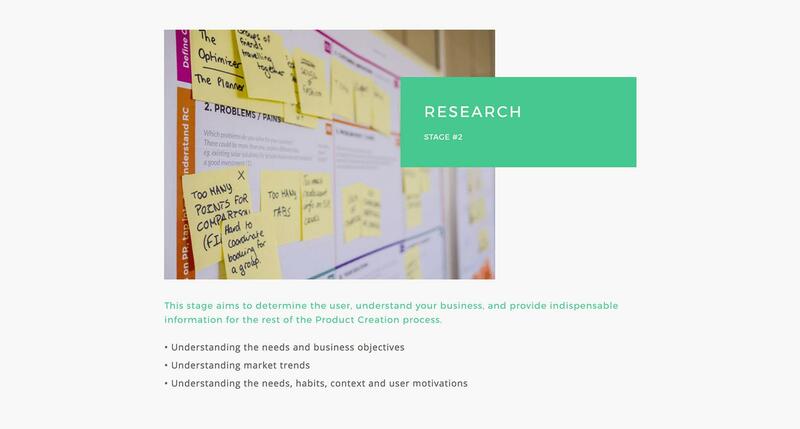 UX design research can be complicated, but designer Maria Corino uses easy-to-understand language to clarify the intent behind her research efforts. It doesn’t need to be extensive, but show instances where you worked well with other design and development professionals. If you have experience working with the C-Suite, highlight it. If you’ve managed a product team or a group of remote workers, make note of it. Self-editing is one of the most difficult tasks for creative professionals, but keep in mind that people aren’t visiting your portfolio to comb through every project you’ve ever completed. Plus, your work from 3-4 years ago is likely much different from the projects you’ve worked on in the last 12-18 months. Show your best, and make sure there isn’t anything that contradicts your normal UX design process. The nature of design work is such that designers often forge close working relationships with project stakeholders. Including a quick, 1-2 sentence testimonial from a stakeholder (along with a headshot) is a great way to inspire trust in the people that will hire you in the future. Just make sure that the testimonials you use are relevant to the kind of UX clients you want to attract. 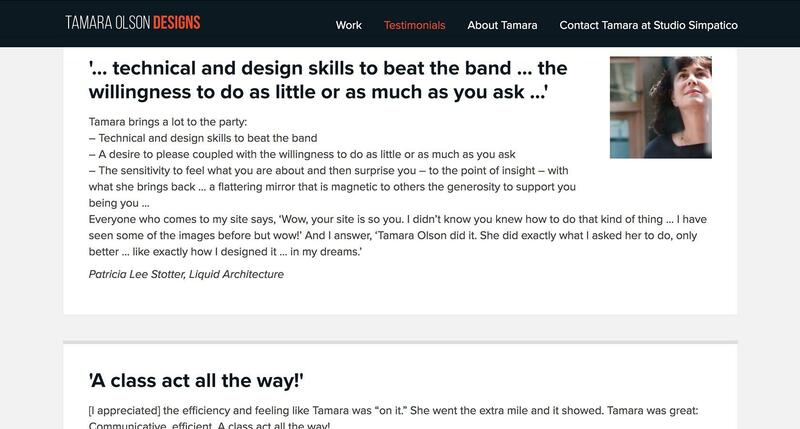 UX designer Tamara Olson relies on a bold headline font to highlight key phrases from client testimonials that speak to her design skills and positive client relationships. It can be powerful for potential clients or hiring managers to experience your projects for themselves, so don’t hesitate to include links to live examples of your work. But don’t rely on links alone. 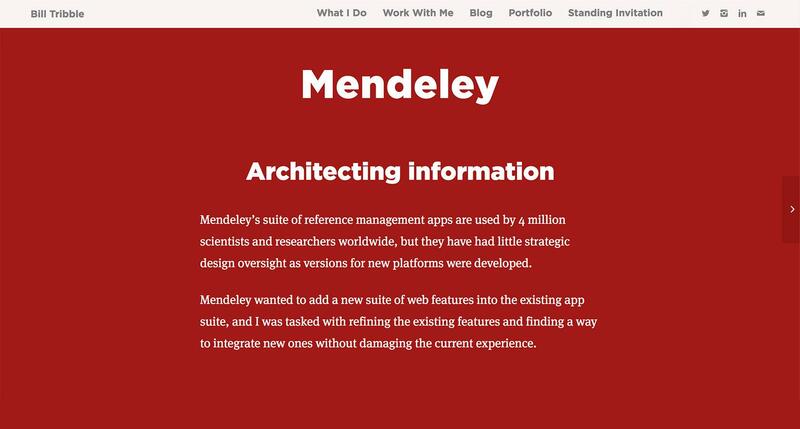 Each project in your portfolio needs context and an explanation of your involvement. A word of caution: Monitor your links from time to time to make sure that your work is still accurately represented. Clients sometimes have a habit of “tinkering” with finished products, and this could make your abilities appear amateurish. This is an easy one to overlook, but it’s important (especially for freelancers) to prompt website visitors to get in touch. Then, be sure to provide one or two reliable ways for people to connect with you. Process is paramount, and UX design portfolios must articulate how designers travel from problem to solution. A UX design portfolio is more than a skills showcase, it’s an opportunity to create an enjoyable user experience and demonstrate mastery of the UX design process. Simple project descriptions and visuals are more effective than technical jargon and splashy imagery. Every project in a UX designer’s portfolio should be clear about roles filled and contributions made. Designers ought to tailor their UX portfolios to a specific audience. 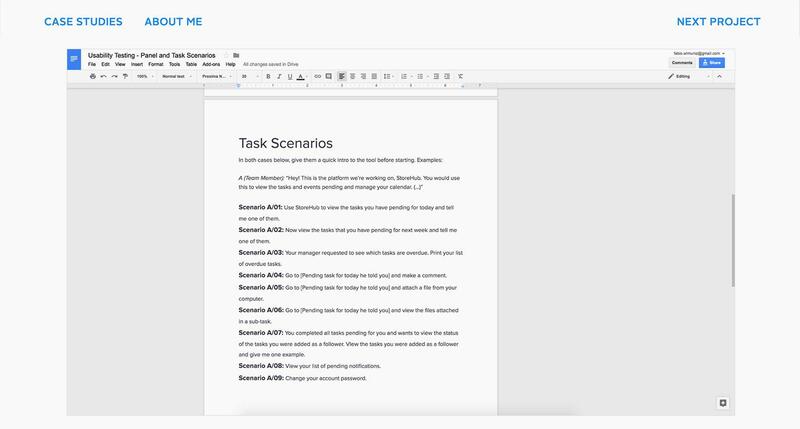 UX designer Fabio Muniz shares a design artifact created in Google Docs. Remember, splashy product images are ok, but they don’t get to the heart of a designer’s process. Make no mistake—designing a UX portfolio site is a sizable job that requires careful thought and execution, but when process is kept at the forefront, it’s one of the best ways for designers to gain access to the careers and clients they’ve always dreamed of. What is a UX portfolio? 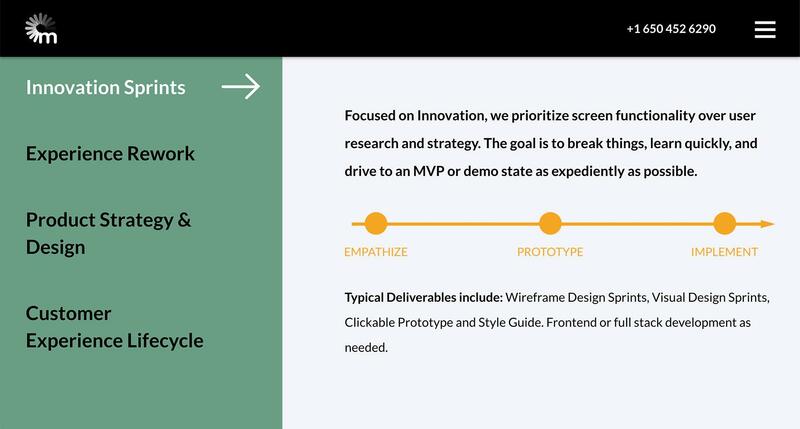 UX designers use portfolios (often websites) to share past projects and the artifacts of their design process with potential clients and/or hiring managers. UX portfolios are an opportunity for designers to demonstrate how they think about and solve design problems. UX methods are techniques that designers use to help solve problems. A common UX method, called a competitive audit, provides a client with a breakdown of competitor advantages and weaknesses. The purpose of this UX method is to help the client understand which strategies are and aren’t working in their industry. A user experience researcher methodically investigates the problems of users in order to provide UX designers with actionable insights that they can use to solve problems. For instance, a UX researcher may observe how users interact with a mobile app and identify pain points that need to be addressed.